FSMOOTHPROOF Conditioner is rated 3.1 out of 5 by 11. 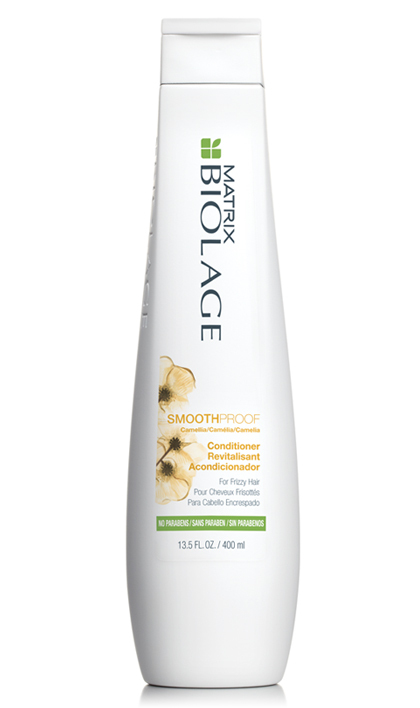 Share https://www.matrix.com/biolage/core/smoothproof/smoothproof-conditioner SmoothProof Conditionerhttps://www.matrix.com/~/media/images/haircare/biolage/core/smoothproof/biolage_smoothproof_conditioner_b-sp-c_na.jpg Detangles and defrizzes hair while providing static control. Detangles and defrizzes hair while providing static control. *When using the system of SMOOTHPROOF Shampoo and Serum. Rated 1 out of 5 by KatelynnMarie from TERRIBLE This product made my hair SO much more frizzy and dried out! I could barely comb my hair after using it. Even when you're applying it to your hair you can literally feel the moisture being SUCKED right out. DO NOT BUY THIS!!!! Rated 5 out of 5 by Danikaiulani from Great products! I've been using Biolage products since Christmas. I typically wear my hair natural so I use the co wash for coarse hair. Decided to flat iron to get a cut and used the shampoo and conditioner. I don't know what kind of voodoo is in these products but my hair is fabulous. Super soft, easy to mange and conditioned. Also moving between curly and straight is usually challenging but my hair loves this stuff! Rated 5 out of 5 by luisa from I love this products. My hair feels heathy and soft. Rated 5 out of 5 by anonymous from Fixed My Fine Hair I have fine limp hair. After using this shampoo and conditioner my hair is fuller, bouncy, and shines. After just a few days, my hair looks amazingly healthy. Best part, was no special trip to a salon, I found this in Walmart. Rated 1 out of 5 by Tabitha from Deep Smoothing Conditioner We liked this at first but then started seeing signs that our hair was drying out. Tried many different ones in the line and yuck. Finally figured out that they didn't just change the bottle, but they have changed the whole line of biolage. Loreal has taken it over and has screwed this whole line up. Have been looking for a replacement for a while now and have found nothing that doesn't leave a residue. One something works....Loreal' just leave it alone. I can find this same crap in your line at walmart.